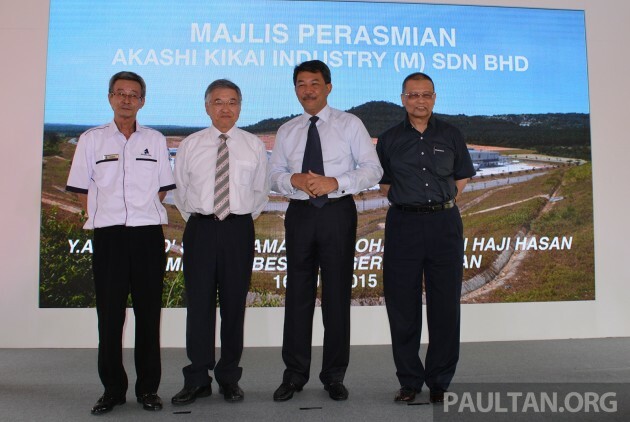 The Akashi Kikai Industry (M) Sdn Bhd (AKIM) transmission plant in Sendayan TechValley near Seremban was officially launched yesterday by Datuk Seri Mohamad Hasan, chief minister of Negeri Sembilan. The RM200 million factory produces the four-speed electronic automatic transmission (E-AT) and five-speed manual gearbox for Perodua, its sole customer. The company’s shareholders consist of Japan-based Akashi Kikai (51%), Daihatsu Motor Corp (39%) and Perodua with a 10% stake. “For this year, Perodua is targeting a new sales record of 208,000 vehicles and this means that we will be keeping Akashi Kikai very busy,” said Datuk Aminar Rashid Salleh, Perodua’s president and CEO. As reported yesterday, P2 has collected 119,000 bookings of the Axia since its September 2014 launch, with 75,300 units delivered up to end-May. The land AKIM sits on was purchased back in March 2012. The company started small volume production in March last year, expanded production volume in August 2014 and achieved stable and full-capacity production status this year. Production capability is 200,000 units a year. So far, AKIM has supplied 180,000 units of the E-AT to Perodua, adding the (unplanned from the start) production of manual gearboxes along the way at the request of the carmaker. Naturally, the factory churns out relatively few MT gearboxes compared to autos, 20% at most. According to Noriyoshi Matsushita, president of parent company Akashi Kikai, exports will be looked at once the main priorities of quality and cost competitiveness are achieved for this young factory. Besides Japan and Malaysia, the company also has a plant in Indonesia. Now that Perodua has got its local supply of transmissions sorted, the next step for Malaysia’s market leader is engines. P2 and Daihatsu are investing RM600 million to build a new engine plant adjacent to AKIM, which will serve the former and possibly the South-East Asian region moving forward. Localisation of parts, especially high end items such as the gearbox and engine, will buffer the effects of foreign exchange volatility. Since now that Made in Malaysia and cost can be even cheaper, can Perodua pls give all their cars VSC and at least 6 airbags? Please stop selling us Moving Coffins. So many Perodua owners have died because you don’t put VSC and more airbags in your cars. Perodua, kenapa mahu untung banyak banyak at the expense of our lives? Perodua, please don’t give us anther Moving Coffin. Our lives so cheap is it? If Picanto can have VSC and 6 airbags, why you cannot give this as standard? That is why this Axia and even Myvi cannot be sold in Europe. Safety fail. Soon Perodua so rich it could buy over Proton’s factory. Tahniah and syabas to Perodua!! I see these marques as marketing/selling or “milking” low safety and low technology cars to developing countries. I also don’t see these marques as flag bearers in their country maybe its the competition or the safety/quality standards are too high or stringent. This is how perodua boost our automotive industry and economy. oh no….this means Perodua cars will be stucked with the 4 speeder for many years to come..